More Business / Job / Trade Scarecrow Ideas! 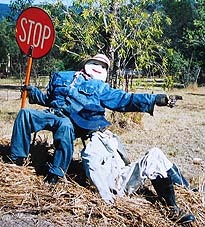 Here is a scarecrow of the famous actor and singer, Will Smith. See other famous people scarecrow ideas. 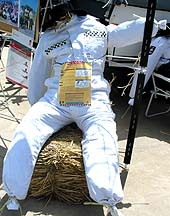 Here is a St John's Ambulance scarecrow idea, promoting the great work of the ambulance workers or paramedics. Here is a pretty little girl ballerina scarecrow idea. 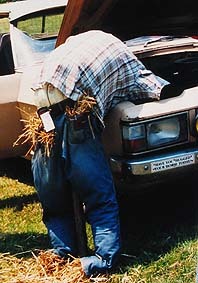 Here is a fun scarecrow idea about a mechanic repairing a car! This scarecrow idea is based on the hardworking volunteer ladies of the Country Women's Association of NSW, Australia -- apron on, ready for action! 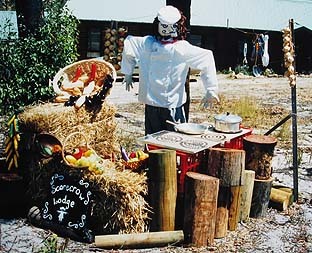 Here is a french Chef scarecrow with a curly moustache and beret, busily cooking a goumet meal on his scarecrow stove! Here is a scarecrow of a juggling clown. See other circus performer scarecrow ideas: clowns, jugglers, tight rope walkers and lion tamer. Here is a chemist or pharmacist scarecrow ready to serve you outside her shop. Here are two road construction workers 'hard at work' directing traffic to the Old MacStrawy Had a Farm scarecrow display. Here is a scarecrow of a old time fireman in his brass helmet from the Strawy Fire Brigade scarecrow display. 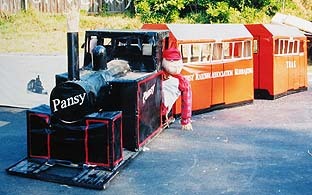 See other fireman / firefighter scarecrow ideas. 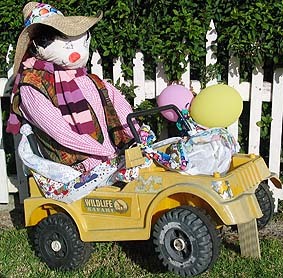 This tour guide scarecrow is driving a Wildlife Safari jeep. 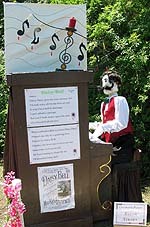 Here is a scarecrow of a music hall pianist from the Bicycle Built for Two scarecrow display. See other musician / singer scarecrow ideas. 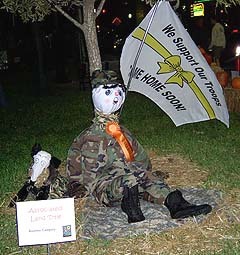 This soldier scarecrow display was created by Associated Land Title, Ocala, Florida, USA. 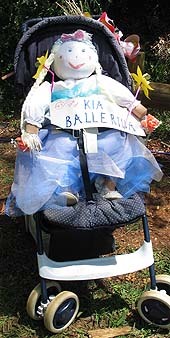 It was part of the Ocala Florida 2006 Scarecrow Festival in Downtown Square. 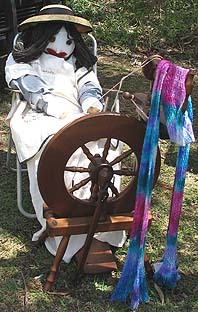 This scarecrow is busily hand spinning wool to make a handcrafted scarf. Her hair is made from handspun strands of wool. 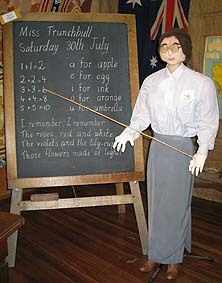 Here is a teacher scarecrow of yesteryear. See more teacher / student scarecrow ideas. 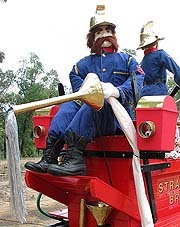 This scarecrow engine driver is in charge of a scarecrow steam train made by the TRAK group, dedicated to restoring the old Pansy steam train line to Kurrajong, NSW. Note: This page includes scarecrow ideas for you and your kids to make about scarecrows at work in their businesses, jobs, trades, occupations or professions: actor scarecrows, an ambulanceman / paramedic scarecrow, a ballerina scarecrow, car mechanic scarecrow, charity worker scarecrow, circus performer scarecrows, chemist / phamacist scarecrow, fireman / firefighter scare crows, four wheel drive tour operator scarecrow, musician / singer scarcrow, spinner scarecrow, teacher scarecrow, train driver scarecrow and many more!